It was a busy morning in the studio yesterday with some very enthusiastic participants in the Bangle and Ring workshop! Each one was itching to get started on making some bangles and rings and to put into practice what they had just learned. Here's some photos taken by one of the students, Christina Lowry of Christine Lowry Designs (A Little Bird Told Me - Craft). Notice how everyone is a picture of concentration! Somehow, she didn't manage to get into any of the photos, which is usually the way when you're behind the camera. But thanks to Christina for all the photos you took for the rest of us! 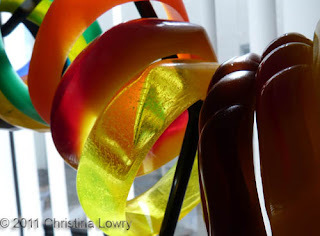 Visit Christina's blog for more photos and her report on the workshop. 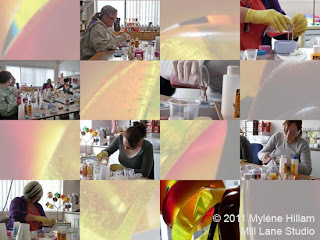 Next weekend will be my last resin workshop for 2011 and there is still a vacancy if you'd like to learn how to make resin jewellery. With just a few short weeks until Christmas, it's a great opportunity to make some gifts for the females on your Christmas list. Visit Mill Lane Studio for all the workshop details and to make a booking. After Saturday 10th December, it will be private workshops only! Tomorrow I'll be back with the beginning of a jewellery making extravaganza: 12 pairs of Christmas earrings in twelve days! Well, maybe not in twelve days, but in the next 3 weeks anyway! I hope you'll join me on my earring making journey! It WAS fun.... even though everyone wa concentrating so hard in the photos. Maybe one day I'll be teaching this workshop in the US... you just never know! I agree, it was fun! Thanks again Mylene. I came home and made two more bangles and rings straight away! Looking forward to trying out my new resin soon too. So pleased you enjoyed it Christine. Glad you made some more straight away... it's the best way to reinforce what you've just learned. I'm sure you'll love switching to Easy Cast - it will give you great results in the moulds.